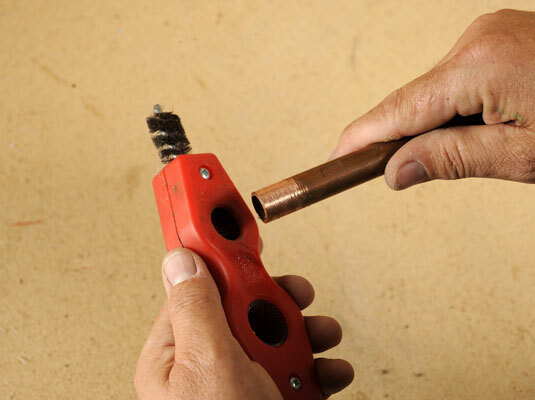 Sweating a copper water line is relatively easy. 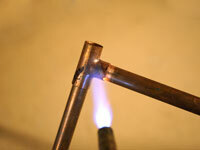 Knowing how to sweat copper pipe allows a do-it-yourselfer to install pipe yourself. A properly sweated joint will last for years (in many cases decades). Sweating copper pipe isn’t difficult, but it takes practice. 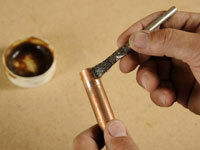 Mastering a perfectly sweated copper joint takes a bit of practice. Be patient! Your first couple of attempts may not look beautiful, but soon you’ll be sweating copper that not only doesn’t leak but also looks good. 1Use the wire brush to clean the pipe. Clean down to bare metal. The flux paste ensures a clean surface for the solder. 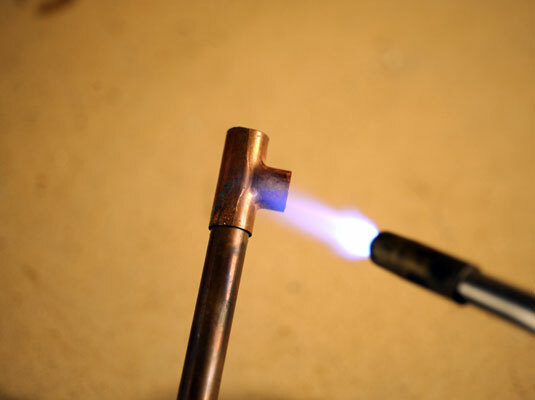 Use a handheld propane torch to heat the fitting. Just don’t get it so hot that you can’t hold it any more. 4Melt the flux paste so that it flows into and fills the joint. 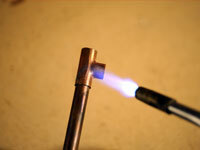 Finally, using the torch, melt the flux paste so that it flows into and fills the joint between the pipe and the fitting.